When he is remembered at all, he is remembered with a reverence befitting a legend. Yet, what did this obscure evangelist teach? The name of William Branham probably will be unfamiliar to most of our readers, but to the Christian world a generation ago, he was as well known as Pat Robertson or Jerry Falwell is today. He was also as different from these two gentlemen as you can imagine. William Branham was an American evangelist who achieved world renown for a powerful healing ministry which began in 1946 and lasted nearly 20 years. He traveled freely among Pentecostal and “full gospel” audiences, yet he taught several questionable doctrines and denied both the Trinity and the eternity of hell. At the time of his death in 1965, he claimed he was the only prophet on earth sent from God to bring the Christian church into final truth. Since Branham’s death, hundreds or churches have been formed around his messages, while his sermons, now meticulously transcribed, have become virtually new Scripture for these churches. The story of William Branham is important because some of his teaching has become seed for aberrational doctrine among Christian groups today. Miraculous visitations and supernatural events supposedly followed Branham from his earliest days. He claimed a visible light hovered over his crib the day he was born (similar to the Star of Bethlehem, marking the birthplace of Jesus). 1 Branham apparently converted to Christianity at the age of 19, and within five years he was pastoring a Baptist church in Jeffersonville. His visions and revelations continued. Branham attended a “Jesus only” Pentecostal revival in Mishawaka in 1936, and felt God wanted him to leave Indiana to evangelize other cities with these people. Yet, disapproval from his in-laws caused him to decide against it. Branham’s first wife and one-year-old daughter died the following year, and he say it as God’s judgment for not going with the oneness Pentecostals. Branham returned to the evangelistic circuit later that year, and went on to go overseas: Finland in 1950, South America in 1951, India in 1954, and Europe in 1955. 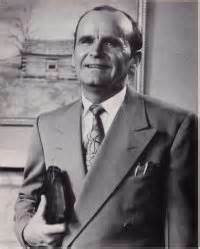 In 1955, interest in Branham’s ministry began to wane, and for the first time in nine years, the William Branham Evangelistic Association was unable to pay its bills The Internal Revenue Service investigated Branham the following year, claiming he owed exorbitant amounts of money for back taxes. When his ministry was still young, Branham restricted his sermons to personal testimony and God’s power to save sinners and heal diseases. Many of his crusades were organized by Trinitarians, and he was content to let others teach while he focused on healing. However, at Branham Tabernacle (his home church in Jeffersonville), he had free rein to promote his real beliefs. Consequently, when his popularity died down in the late ‘50s, Branham turned his attention to the churches which not believed his message, and his doctrinal peculiarities became more and more pronounced. Branham generally described the Father, the Son and the Holy Spirit as being three “titles,” “offices,” “attributes,” or “merits” of God. 9 The problem with this explanation is that titles, offices, attributes, or merits cannot relate to one another on a personal level. The Bible shows that a personal relationship exists between the Father, the Son and the Holy Spirit. “The Father loves the Son” (John 3:35); the Son glorifies the Father (John 17:4); the Son sends the Holy Spirit (John 16:7); the Father “knows the mind of the Spirit” (Romans 8:27); the Holy Spirit listens to Jesus and testifies to others of Him (John 15:26, 16:13). If the love, communication, and relationship between the Father, the Son and the Holy Spirit is to be meaningful, there must be a distinctly personal self-consciousness between the members of the Godhead. Branham also claimed God revealed to him a complex doctrine known as “serpent seed.” 10, pp. 97-107; and Conduct, Order, Doctrine of the Church (Tucson: Tucson Tabernacle Books, n.d.), Vol. 2, pp. 821-23, 1131-36] In a nutshell, Even’s sin in the Garden of Eden was not eating a fruit but having a sexual relationship with the serpent. Before the fall, the serpent “was somewhat in between a chimpanzee and a man, but closer to a man.” 11 Satan entered the serpent and seduced Eve. Thus, Cain was begotten by Satan not Adam. At the same time, there is also a “seed of God,” a lineage or people irrevocably predestined for salvation. This group is the true Bride of Christ. They are predestined to hear and receive the “message” of Brother Branham. Branham taught other doctrines of questionable validity. He denied that hell was eternal, and maintained that Satan and all the wicked would be annihilated. He claimed that the passageways in the Great Pyramid and the twelve signs of the Zodiac, though inferior to the Bible, were also revelations from God. Branham’s concept of Jesus was unscriptural in at least one important respect; he asserted that during the days that Jesus lived on the earth, He was the Son of Man, not the Son of God. Branham declared, “He never said He was the Son of God.“ 14 Branham taught that Jesus became the Son of God (i. e., the Holy Spirit) after His ascension into heaven. Modern faith teachers seem to have appropriated this doctrine. The idea that faith is a force – which, when activated by the spoken word, inevitably brings things into existence – may well owe its genesis to Brother Branham. Another carry-over from Branham into contemporary circles involves the doctrine that the Bride of Christ is different from the assembly of born-again Christians generally. Branham taught that only the elect Bride would be raptured, while the great majority of Christians – those who had not accepted his message – would face the Great Tribulation. This two-story version of Christianity is replicated in many “higher light, deeper truth” groups, who basically have developed their own variations on the above theme. With the purest of motives, members of these groups often come to see their spotless and unblemished condition (Ephesians 5:27) as a consequence of following the prophet (whomever he might be). Subtly, the believer’s acceptability with God is no longer based solely on the blood of Jesus, but on adherence to dress codes, baptismal formulae, and following a proposed “divine order.” At the end of this road lies the cultic doctrine of the “one true church,” pushing ordinary Christians who are merely born-again off to one side. It is imperative that we evaluate Branham’s claims by the only valid test there is: conformity to the Word of God. Some followers of Branham would claim that his many miracles and the accuracy of his words of knowledge (or “discernment”) must make his doctrines true, validating his subsequent revelations. In subjecting Branham to his own standard, we sincerely feel his claim to be the only prophet for today should be rejected on several levels. To begin with, the concept that each period of Church history has its own prophet is pure conjecture. There is no biblical evidence that the seven churches of Revelation are meant to be interpreted as seven successive periods of time, nor is there any command in the New Testament to follow a “prophet” other than the Lord Jesus Christ. Second, if Branham really was sent from God to correct the Church, he would have been theologically sound on basic doctrinal issues such as the Trinity. Branham’s modalistic view of God, basically a variation of the “Jesus only” churches, cannot answer the Bible’s evidence for personality within the Godhead. He also should have been sound on such a basic issue as whether Jesus was the Son of God while He was on earth. Third, we should expect that a true prophet would describe his opponents accurately. A prophet who denounces heresy must be able to “lay his finger” on the real problem. Branham regularly claimed that Trinitarians say there are “three gods,” when in actual fact, Trinitarians always have said there is only one God. If Branham was a true prophet, he wouldn’t have misrepresented the teaching of his Christian brethren. “My little children, let us not love in word or in tongue, but indeed and in truth. And by this we know that we are of the truth, and shall assure our hearts before Him … Now he who keeps His commandments abides in Him, and He in him. And by this we know that He abides in us, by His Spirit whom He has given us”(1 John 2:3, 24; 3:18-19,24). Although William Branham was sincere and felt he loved the Lord, he did not adhere to biblical truths. As we have seen, he was not informed about the teachings of the Bible, and he was deceived in several respects. There were many more doctrinal irregularities than we have had space to explore in this brief article. To those who believe that Branham’s healings vindicated his authority, we reply that divine healing is meant to draw people to God, the Healer, not to any human vessel. The Journal would like to thank Eric Pement for untangling this issue’s “Spider’s Web.” Eric is a Senior Editor of Cornerstone magazine.This article was reprinted with Eric’s permission. It originally was published under the title, “William Branham: An American Legend” in Cornerstone, vol. 15, issue 81, pp. 14-17. 1986. We recently had two men come to our fellowship. They were immediately recognized by one of the elders and promptly publickly told to leave the premises. They haven’t returned. After going through the above article and the analysis of Branham ministry, I realise that people have not yet understood well the ways of The Lord. When Jesus came, the clegy of then never managed to understand Him and His ministry until they condemned Him to death. Very few prophets were understood and accepted by the peoples of their time. If a prophet has to be agreeable to the erring clergy of the time, how can you judge the prophet by he who is standing in the wrong misinterpretation of the scriptures. That’s why they killed Jesus. He said He was God and they said it was blasphemy, which was correct to their misinterpretation of the Scriptures, yet Jesus was correct according to the interpretation of the hour. We should not fight for God, we should not just be comfortable with what we have already learnt. The things of God are never obvious! A True Prophet Vindicated By God Always Compliment The Scripture. John6:38, 7:16-18,28. He That Is Sent From God Speaks The Infallable Word Of God John15:15, If He Is Really A Prophet Vindicated By God, How Did He Get All Those Anti-Scriptural Theories And Doctrine? Any Angelic Commission/spiritual Vision That Contradict Scriptural Teaching Is Not From God. Visions And Commission Must Agree With The HOLY BIBLE Which Is The Supreme Final Court Of Appeal, And The Only Tool To Judge If A Doctrine Is Of God Or From The Pith Of Hell. I Beseech You All To Read Your Bible On And On Over And Over, Then Stand On Its Truth And Practice It. Shun Falsh Teachers And Prophet, Escape For Your Dear Life, We Shall Meet In Heaven. William Branham was not a true prophet vindicated by God. He was a false prophet who gave prophecies that did not come to pass. In 1965, he told Billy Paul that Los Angeles would slide into the ocean before he’s an old man. He gave a “Thus Saith the Lord” on it also, but Billy Paul is almost 80 years old, an old man by any standards. WMB said that the Angel of the Lord told him personally that Marilyn Monroe (age 36) died of a heart attack, when she actually died of an overdose of Nembutal and chloral hydrate sleeping pills, 60 to 90 pills, enough to kill 10 people. WMB had a vision of himself inside a revival tent, doing miracles and healings so powerful that no one could imitate or duplicate them. But that vision also failed to come to pass. In fact, if you check the record of all of William Branham’s major visions and signs, you will see that they failed to come to pass. If a prophet speaks in the Name of the Lord, but the thing does not follow or come to pass, this makes him a false prophet, not a vindicated prophet. And today…the New Apostolic Reformation people say that they have to learn to be prophets and that if what they say doesn’t come to pass they are still learning. Not what God’s Word tells us, is it!! False prophets will abound in the latter days. The General Public Should Take Note Of These Point, That Any Miracle, Be It Healing, Deliverance, Discerment, Word Of Knowledge, Prophecy And Whatever Gift Manifestation That Is Meant To Draw People To The Human Vessel Is Not From God. Signs And Wonder Is Meant To Draw People To God, That Work The Miracle. Act3:1-26, 4:1- 4, Whichever Multitude That Follow A Human Vessel Instead Of God Are Mist Multitude.